Besides my children, I had never encountered any goblins before. I thought this was the perfect opportunity to do some research so both you and I could be more informed next time we happen upon a goblin. Goblins hate Horses. While goblins excel at riding animals, they do not quite get the whole horse thing. Their hatred of horses is only second to their fear of horses, who tend to step on goblins who get too close. Goblins also hate Dogs. Even though goblins are quite adept at riding wolves and worgs, they are quick to explain such animals are not in fact dogs. Freaks. Goblins Love to Sing: Sadly for goblins, as catchy as their melodies and lyrics tend to be, the subject matter of goblin songs tend to be a bit too creepy to hit the mainstream. Goblins are a Little Crazy. They tend to be easily distracted, particularly by shiny things and small animals that might make good eating limit their ability to execute even well thought out plans. Now you know for next time a goblin wonders up to your doors. Greedy Goblins are menacing little creatures, and Betsoft Gaming has managed to capture the nature of the creatures so well. The music enhanced the impish delight that this slot is. The reels have a host of mischievous goblins lurking in the background. The reels are set in a deep dark forest with a goblin guarding them at all times. Or maybe he is just distracted by the shiny objects on the reels. Greedy Goblins has many features to bring about wins. This, as with most of BetSoft’s games is the complete package for an excellent gaming experience regardless of where you decide to pay it. 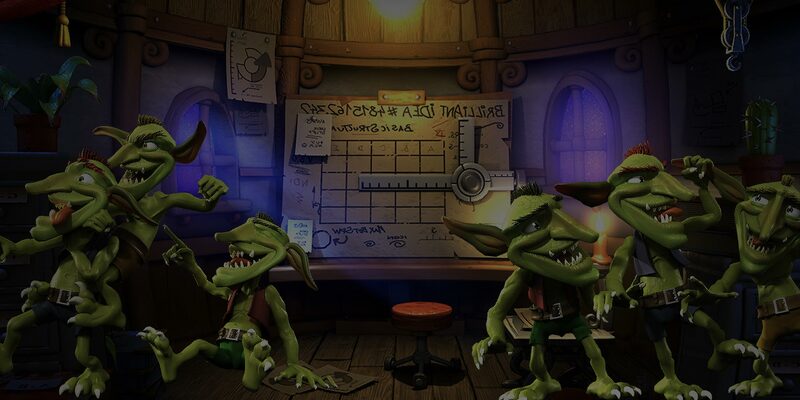 The goblins get up to no good along 5 reels, and with 30 pay lines, they have plenty energy and opportunity to conjure up brilliant wins. BetSoft has once again produced outstanding animations on this slot. The symbols on the reels are divided into 3 levels of value in symbols. The highest paying symbol is the goblins enemy elf. Joining him as high paying symbols are the main character, green goblin, and a toadstool. Medium paying symbols area goblin crown, a trophy, and shiny gems. The lowest of the symbols include the moon and a wanted poster. The controls have been included in the theme, with spin and max bet sitting on 2 toadstools with the double up and autoplay controls to their right. The rest of the controls include choose bet, total bet and bet per line. On the top right-hand corner of the reels you will be able to access the paytable which will help you see just how many added features this game holds. The first feature we are going to talk about is the free spin round. The most exciting thing about this round is that not only do you get up to 25 free spins when 3 or more scatters land on the reels, but random symbols are then branded with up to a x10 multiplier. This will multiply the value of the symbol with up to whichever multiplier is showing at the time. There is a sticky wild feature that allows for up to 3 respins as well. Should another wild land at the same time you can get as many as 6 re-spins. The elf can trigger the Progressive Jackpot by you landing 5 of him on the reels. You will be able to see what the jackpot is standing on by looking at the top left of the reels. The Bonus round is trigger by 2 or more of the book of secret landing on the reels 2 and or 4. You get to select various areas on the reels to claim prizes. You keep at it until the collect prize is revealed. The coin drop round allows to coins to drop randomly and goblins will come out and grab them. Each collected coin allows new symbols to fall in from the top of the reels. Coins received, result in extra wins and all wins that are a result of a coin collected, form new pay outs. Last but not least the Double Up feature. You choose between the goblin and the elf and if you choose correctly where the coin lands you double your money. What an excellent game from BetSoft. I wasn't sure what I enjoyed more, the animation or the gameplay. There was just so much on offer in every respect. I may even have o soft spot for the mischievous green goblin that wallops about. The depth of this game is fantastic, and you will be sure to have fantastic wins with all the features. A fantastic gaming experience from BetSoft that all slot lovers should visit. There really is something for everyone here, and you will most certainly not be disappointed.